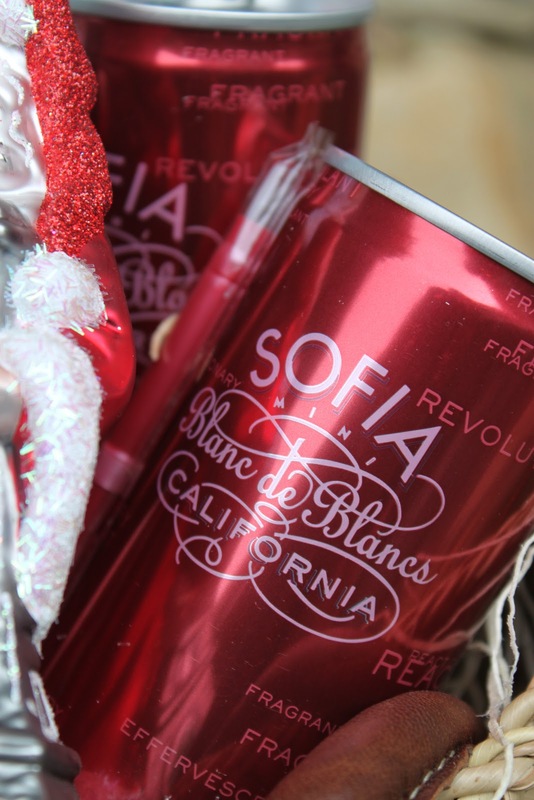 Set of 4 Sofia Coppola Blanc de Noir Champagne... perfect for the beach, pique-nique or cinema... we all know how Fifi loves bubbles!!! Total value of this FABuLOUS French Basketeer GIVEAWAY $150.00... Andddddd it can be all YOURS!!! You must be 21 years old or older to enter! Leave a Comment with "FRENCH BUCKET"on my FifiFlowers Twitter page for 3 entries!!!! I so love this basket give-away! You are always such and inspiration! I've tweeted, commented and posted!!! Mon chere Fifi - you've outdone yourself again!!! The basket looks wonderful. Hope I win - pick me, pick me! I would love to have my name entered for your beautiful basket give-away! Thank you! I'd love to win -- especially the calendar! Love that basket and such a sweet giveaway! Your art is gorgeous. Hi Fifi, what a fab giveaway. Who would not want to win something like this. please count me in. Now over to facebook. Love, Love the basket...Thank you! Pamie G.
Love the basket and love to give it a go! So here I go !! I would love to win this basket... great giveaway! 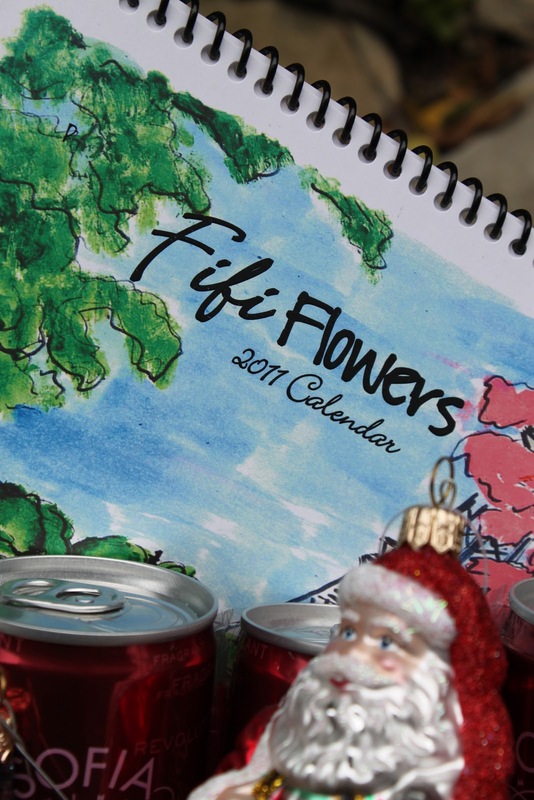 Love your artwork Fifi and would love to win that basket! The basket and goodies inside are all fantastic! What a great giveaway, just like all of your paintings. I would love to win this, thanks for the chance. I would die of excitement if I won this! 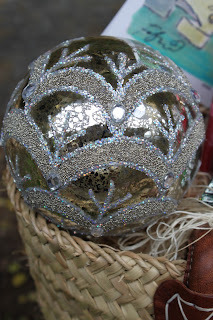 WOW,I am lovin all the great Christmas stuff and the darling basket! Fingers crossing!! I spied that Santa the first thing! What a wonderful giveaway! I am a follower, tweeted and liked on Facebook, and I have added you to my sidebar! Put my name in the hat several times please. Following you on Twitter, retweeted, and tweeted about the giveaway. I posted on your FB page. Beautiful gifts. Fifi, a wonderful giveawy. As you know I adore you and Andrea from the French Basketeer!! I follow you everywhere!! This would be a very special gift for a dear friend. Wow! What a terrific giveaway. Winning this would be the closest to France I will be for a long, long time. Fingers crossed. I really want the calendar! What an awesome giveaway! Thanks for the chance. Posted on your facebook page! I know you have missed me and have been so worried because that's what bffs do when one has been MIA for months on end. Oh, Fifi, the surveillance of my every move has been relentless but with the help of a young lovely boy, I have ditched those nasty men and am once again free to live my fabulous life as I choose. The basket you are giving away reminds me a picnic you and I had on the edge of the Seine. What a lovely afternoon that was...until after a few or ten sips of something lovely I thought it was the perfect time to perfect my swan dive. Fortunately for me, the arresting officers were so handsome in their uniforms and their oh so French way of sounding firm and punishing gave me many delicious day dreams in the days that followed! We have had some lovely times together, haven't we, Fifi? 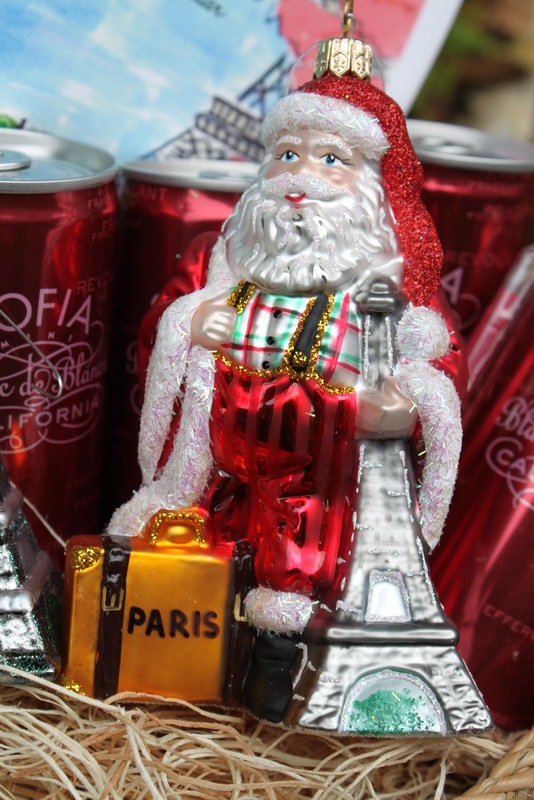 Very soon I will be answering your Christmas wishes and coming to you! I'm sure my absence has made this a lost year for you but never fear! All will be made up as soon as you seem me and we celebrate our reunion. Petunia who has been to the ends of the earth running for her life because of a very minor misunderstanding concerning a Sheik, a camel and some lovely diamonds. oooh Petunia... the memories!!!! Good to hear from you... I MAY need your help AGAIN... French Basketeer mentioned a recent ART theft of a Picasso I believe she said... Petunia... why is that EVERYONE always mentions art theft to moi???? Haven't I always had my name cleared... let me know if you have heard my name mentioned in your circle... if I must go underground again... do you have a location in mind? I've missed you terribly mon amie!!! I am reluctant to tell you of what I have heard. I had hoped we could discuss this matter face to face over a few sips of something lovely and calming. However, as you have asked, I suppose my plan is moot. I was at a rather lovely party the other evening, one thrown in my honor to celebrate my return into society, when one rather odd looking older man gently but firmly guided me from the room to a balcony and asked me in a whispered voice if I knew anything about this missing Picasso. Oh, Fifi, I could hardly concentrate on his questions! His eyebrows were driving me insane, If I had had in my possession a small pair of hedge clippers, I would have addressed the matter and then been able to think properly for the correct answers, made up or otherwise. It would seem there are a few powerful people who think you might have had a hand in its disappearance however, I told this irritation of a man that I know for a fact you only think about spiriting away Matisses and that any more talk of your involvement was at best classless ugly gossip. I do hope that was a correct answer. Those eyebrows were so distracting....And my glass had run dry. I could barely think! Oh, Fifi! I do know how lonely it is to be on the run alone. After this last go around I have gotten so much better at it and would delight in showing you what I have learned! Other whispers say they are looking for you in Belize so I say we fly across the pond and find a lovely out of the way villa in France to spend our holidays. Shall I gas up the jet? Oh yes, the jet was part of my settlement with the Sheik for being wrong about so many little things so we no longer need to borrow one for our escapades! Isn't that just marvelous, Fifi? One never knows when one will profit so nicely from nasty little lies. And this may be the case for you as well! Petunia who anxiously awaits your response. ooooh you are soooo right Petunia... Fifi quite fancies MATISSE paintings... there are ONLY certain Picasso paints that Fifi adores and one is close enough for her to pop in and take a peek of from time to time... HOWEVER... I would adore placing my little fingers on it as it looks like DELICIOUS thick frosting.... oui oui oui the people at Norton Simon will not let Fifi touch Woman with Book... le sigh! ooooh jetting away sounds DIVINE... thrilled that you have one in your grasps at all times... lovely that you always find a way to get EXACTLY what you WANT!!! ooooof course France is usually my kind of place to runaway to... oooh la la... is there a better place for Fifi???? I think not! oooooh and I believe BUBBLE are calling out to Fifi!!!! 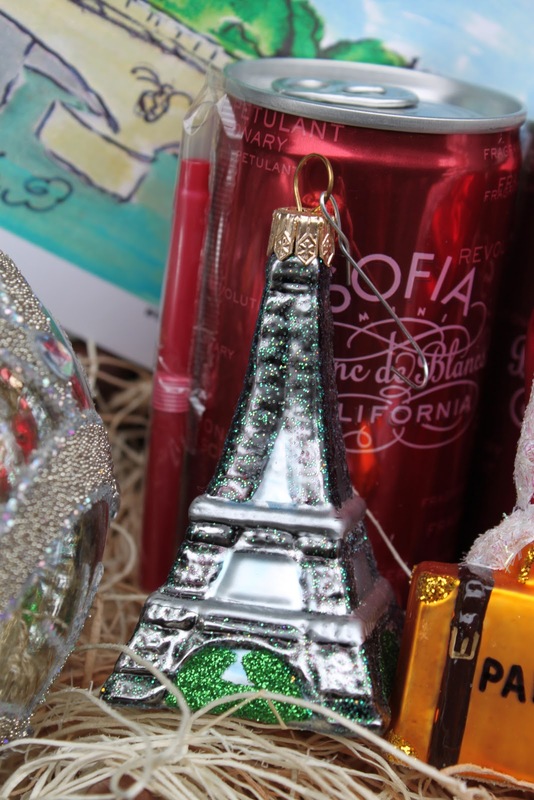 Hello Fifi - what an amazing giveaway! I am followong your instructions to the letter and will cross my fingers as well! You are going to have hundreds of entries - are you kidding me!!! oui oui oui!!!!! count me in - I don't twitter but I will do everything else! Just passing by and saying hello. What a wonderful giveaway!!! I had the opportunity to visit Paris 4 years ago for Christmas/New Year and that will be perfect to celebrate and remember the most wonderful trip in my life!!! Wonderful basket! And goodies inside! Everything is exquisite in this giveaway. Love the Santa Clause--so charming. I'm your Facebook Fan and left a "French Bucket" message on your wall. "French Bucket". Pick me...fan of your writing and your art. Love this giveaway! I am now following your blog, I left a comment on French Bucket on both Facebook and Twitter. So that's 6 entries, right!? Love it and your work! Would be awesome to win! Ooh la la...I love giveaways! i am new to your blog and i love your style!! i just bought a print from your etsy shop! happy holidays! Your prize package is magnificent! she was 13 years old. Anything French means a lot to me! The French Basketeer Moroccan Bucket Tote looks very unique and useful. Thank you so much for the entries! What a wonderful giveaway! Thank you Fifi for your kindness. Mon chere Fifi, I plan to go out and purchase the bubbly! Love the basket, would be divine to win! Oh my goodness! So much French goodness here!!! I am crossing my fingers and promising Santa to be very nice. Wonderful holiday basket. Great way to start put the Christmas Season!!!!! Beautiful, useful and fun all rolled into one!!! Just "Love" the thoughtful gift basket!!! So much fun today on your blog. lovely basket of goodies . . . especially love the calendar. I love that Santa!!! Fingers crossed! Oh Fifi!!! This is lovely!!! Wrote on your fb wall. please count me in for the giveaway!!!! 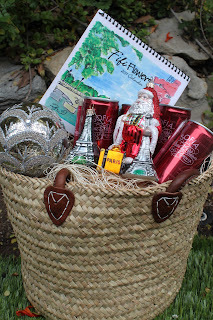 Fifi Cherie...I will tweet, facebook, and cross fingers to win this fabulous giveaway!!! I facebooked! Do you have to leave a comment twice to be counted twice? I did it all. Are we supposed to add our comments three times, 2x etc for each entry? Oh Please count me in!! This is a wonderful Giveaway-thanks for hosting it!! What a wonderful basket! So many great holiday items. Happy Holidays! Thank you for the generous contest. What a carefully thought out prize. Every single item is a treasure. Adorable work! I was just in Paris two months ago, and em reliving my trip through your art. Magnifique! I'm so glad that I found this blog - it's great. I love the fab basket giveaway. Oui, Oui, Oui! Love French Basketeer and Fifi Flowers! Oui, Oui, Oui! Love French Basketeer and Fifi Flowers!! I LOVE, LOVE, LOVE your work!!!! Oh fifi what a fabulous giveaway. So beautifully put together by you & Andrea. Sending holiday cheer your way! I 'tweeted' about your the French Bucket giveaway @dumbwittellher! I too commented about the French Bucket on your facebook fan page.